Record Store Day is April 13 and as usual, this year’s list of exclusive titles is long enough to make even the biggest record nerd’s eyes glaze over, full of reissues of records that are not hard to find originals of, reissues no one asked for (Mickey Mouse Disco? Transformers: Revenge of the Fallen soundtrack?). 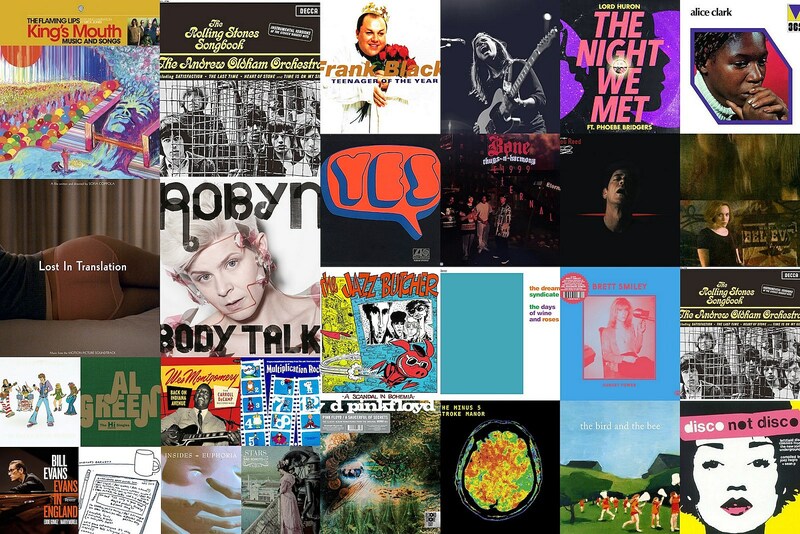 But there’s a lot of good stuff, too, from reissues (Pink Floyd, Robyn, Bone Thugs-N-Harmony, Frank Black, The Dream Syndicate) to brand new music (The Flaming Lips, Courtney Barnett, Julien Baker), to records you didn’t know you wanted (Alice Clark, Brett Smiley, Andrew Oldham Orchestra) and more. Here are our picks, including a few multiple titles by single artists, in alphabetical order. What RSD19 titles are you looking for? When he wasn’t managing the Rolling Stones, Andrew Loog Oldham made groovy, orchestral easy listening versions of ’60s pop hits with a group of session musicians. The Andrew Oldham Orchestra’s third and final album was all Rolling Stones songs, full of strings, harpsichords and oboes. Most famously, the album’s version of “The Last Time” was sampled by The Verve for “Bittersweet Symphony” (which is its own a long story), but the whole record is pretty cool. Record Store Day is often about special editions or reissues of previously-released work, but sometimes artists save anticipated new music for RSD and that’s just what Courtney Barnett has done. She’s following last year’s excellent Tell Me How You Really Feel with a brand new song, “Everybody Here Hates You,” and unless it hits the internet sometime before April 12, this 12″ single will be the first time you can hear it. It comes backed with “Small Talk,” a non-album song from the Tell Me How You Really Feel sessions that surfaced last year, and it features artwork designed by Courtney herself. Inara George and Greg Kurstin’s first two albums as The Bird and the Bee are jazzy, charming and fun pop records. Both only got limited vinyl releases when they first came out and are now collectors items, so it’ll be nice having more hitting the market on RSD. Their self-titled debut has been expanded to include the Clap Your Hands EP which has never been on vinyl. You don’t have to listen too close to hear people crying out for vinyl reissues of the first two Frank Black records from 1993 and 1994 after he disbanded the beloved Pixies. These have long been on peoples’ wish lists and, finally, here they are. Both albums were recorded and produced with Eric Drew Feldman whose CV holds among it recordings with Captain Beefheart and Pere Ubu. The debut sounded a lot like the Pixies — which was not a bad thing at all — but it was on Teenage of the Year that Frank Black really stretched out and widened his sound. It was a long double LP feast that contained treat after treat. “Speedy Maire,” “Headache,” “(I want to live on an) Abstract Plain” are all classics that should sound glorious on wax. NWA’s Eazy-E took Cleveland rap group Bone Thugs-N-Harmony under his wings, signed them to his label Ruthless Records, and executive produced their early material. Their sophomore album, E. 1999 Eternal, which E worked on before his untimely death, ended up turning into a tribute to E. It also proved to be a major breakthrough for the group and it’s still a classic today. In recent years, they’ve done anniversary tours for both the album and its single “Tha Crossroads” (which is also a tribute to Eazy-E), and now E. 1999 Eternal is getting its first-ever official vinyl release in the US. A real treat here. In 1972, a little known singer went into the studio and recorded what would become, to the underground heads at least, a soul jazz classic. Not much even today is known about Miss Clark or even who were the musicians she recorded this with, but that is all about to change with this first ever official worldwide reissue. Originally released on the legendary Bob Shad’s Mainstream label, this reissue is courtesy of the somewhat new but so far worthy WeWantSounds label which is overseen by two Parisian crate digging gentleman, Matt and Oliver. For this release they worked with Bob Shad’s grandchildren, some of you should know: the comedian, writer and director Judd Apatow and his sister Mia. Besides what should be stellar sound, this will also include writings and photographs that finally pull back the curtain on the mysteries surrounding this wonderful recording. Caveat though, this is one of those limited regional releases so it’s gonna be in hot demand. Before “Conjunction Junction” and “I’m Just a Bill,” ABC’s Saturday morning series Schoolhouse Rock began by teaching the times tables tunefully, with now-classic songs written by the great Bob Dorough. Chief among them: “Three is a Magic Number” which De La Soul sampled on their 1989 album Three Feet High and Rising. Paisley Underground heroes The Dream Syndicate’s debut album (and arguably finest moment), 1982’s The Days of Wine and Roses, gets it’s first legit vinyl reissue, with this band-approved remaster. The set also comes with a vinyl reissue of the band’s indie-released four-song EP from the same year, as well as a reproduction of the sole 7″ from frontman Steve Wynn’s earlier group, 15 Minutes. It’s become a certainty at this point that every Record Store Day, one of the highlights will now be whatever is on the menu from Resonance Records. George Klabin and Zev Feldman’s upstart label has hit home run after home run in the last few years with projects that are magnificent in curation, sound and packaging, This year’s two releases once again mine the works of artists they have previously released records. The Bill Evans offering is a live club recording of his not as familiar, but no less exciting, late 60’s lineup. Wes Montgomery is a deeper trawl through the recordings he made in the beginning of his career in Indianapolis before he began his stellar career recording for Riverside, under the guise of arranger Carroll DeCamp. Both should be top notch. The Flaming Lips’ 15th album features 12 songs inspired by an art installation frontman Wayne Coyne created back 2015 and are connected by narration from The Clash’s Mick Jones. Word is the record hearkens back to the cosmic pop of The Soft Bulletin (which turns 20 this year). This will be the only version of the album available till it gets a wider, and perhaps slightly altered, release in July. It’s shaping up to be a big year for legendary soul singer Al Green. Last fall, he released his first recording in a decade, and now he’s set to go on his first tour in seven years (including a night at Radio City Music Hall). Hopefully his comeback continues after that, but meanwhile, you can get this very cool box set celebrating his classic ’70s era. It collects the 7″s for each of the 26 singles Al Green released during the ’70s, including favorites like “Let’s Stay Together,” “I’m Still In Love With You,” “Call Me,” and many others. The box also comes with a 56-page hardback book; liner notes by Robert Gordon, Bob Mehr & Geoffrey Himes; and a Hi Records 7” adapter. UK duo Insides’ sound fell somewhere between ethereal synthpop and post-rock, and their 1993 debut album, released on short-lived 4AD imprint Guernica, was mostly ignored at the time but has become a cult classic. (It has definitely gotten better with age.) Original copies of Euphoria go for well over $100 so this is a welcome reissue. Eccentric UK indie singer-songwriter the Jazz Butcher made three records in the mid-’80s with producer John Rivers and a band that included former Bauhaus bassist David J. Quirky, funny, thoughtful and tuneful, these three albums are getting their first vinyl pressings since their original release 30+ years ago. All are worth picking up. Lord Huron had a major breakthrough when “The Night We Met” became a surprise success thanks to being memorably used in Netflix’s 13 Reasons Why, and the success led to them signing to a major label and making their album yet, Vide Noir, which was more psychedelic, more rockin’, and catchier than anything they’d done before. The new and improved Lord Huron also re-recorded “The Night We Met” for season 2 of 13 Reasons Why, making it sound more in line with the Vide Noir material. And making the new version even better, the great Phoebe Bridgers added guest vocals. This superior version of the song is now coming out as a 7″ on RSD. When Scott McCaughey suffered a stroke in 2017, doctors warned him he might never play music again, but he began writing his next album while still in the ICU. He wrote down whatever thoughts came to him, and that stream-of-conscious notebook became the basis for Stroke Manor which features contributions from Peter Buck, Joe Adragna, Jeff Tweedy, and more. Like they did in 2018 with Piper at the Gates of Dawn, Pink Floyd’s second album (and only one to feature both Syd Barrett and David Gilmour) is getting the mono remaster treatment, remastered from the original mono analogue tapes by James Guthrie, Joel Plante and Bernie Grundman. There are 6500 of these made, but they’ll still go fast. Welsh band The Pooh Sticks were initially known for shambolic, ironic indie singles like “Indiepop Ain’t Noise Pollution” but they dropped this ambitious cult classic masterpiece in 1991 that gleefully, unashamedly ripped off moments from pop and rock’s past and remade them as their own. This is the first reissue of the long-out-of-print album ever. Original vinyl copies of this 2010 album — which combined Robyn’s two Body Talk EPs plus a handful of new songs (which came out as Body Talk Pt 3) and includes her insta-classic “Dancing on My Own” — regularly fetches for over $300 on Discogs, so this is truly a much-needed reissue. Glam rock cult musician Brett Smiley only released one single during that glittery era, but this compilation unearths demos and acetates from the era, including a session produced in 1974 with Del Shannon (funded by Andrew Loog Oldham for a supposed $200,000). If you dig T-Rex, Bowie and Jobriath, you’re gonna want this. Before Soccer Mommy made her studio (and Fat Possum) debut with 2018’s great Clean, she put out tons of home-recorded releases on her Bandcamp. One of those releases, the For Young Hearts EP, only ever got the digital release and a cassette release limited to 300 copies, but now it’s coming to vinyl for the very first time. The EP is a cool look into the beginnings of an artist who made one of the most-loved indie albums of last year, and this 12″ vinyl release comes on green smoke vinyl in a gatefold matte jacket with a lyric sheet and a 24″ x 36″ Soccer Mommy poster. Stars followed their acclaimed third album Set Yourself on Fire with In Our Bedroom After the War in 2007, and the next year they shared even more new music on an EP. Sad Robots finds Stars at the top of their game making beautiful melodrama on songs like the cathartic “A Thread Cut With a Carving Knife,” and the languid “Undertow,” as well as a live version of Nightsongs track “Going, Going, Gone” and a few others. The EP was only released digitally and on CD in 2008, and now it’s getting its first vinyl release, in the form of a 180g sea foam green 12″ vinyl. Among Rhino’s bountiful offerings this year comes a vinyl reissue of Yes self-titled 1969 debut album which will recreate the original pop art UK cover. While still searching for the sound that would become their signature, this lovely debut hints at pop, prog, jazz and psychedelia with its mix of covers and originals and seriously stunning work by guitarist Peter Banks and drummer Bill Bruford. What makes this reissue so special is word leaked out that this will be all-analog (AAA), cut from the original tapes and mastered by the revered Kevin Gray. Yes please! Originally released in 2000, this compilation of funky post-punk and leftfield disco — that ranges from Yoko Ono, Liquid Liquid, Loose Joints and Steve Miller Band’s 16-minute “Macho City” — inspired multiple sequels and hit right before the early-’00s renaissance of Yeah Yeah Yeahs, Liars and LCD Soundsystem. First time on vinyl since it’s initial release. For the soundtrack to her 2003 film Lost in Translation, she coaxed My Bloody Valentine’s Kevin Shields out of his cave to write the score. Dreamy and beautiful, those songs and compositions sit alongside tracks by The Jesus & Mary Chain, Phoenix, Air and more to create an appropriately hazy soundtrack for this tale of two people looking for themselves in Tokyo. First time on vinyl since its original release. Written by Amanda Hatfield, Andrew Sacher, Bill Pearis and PSquared.